Modern pagans draw from a variety of cultural wells, both historical and contemporary. All too often the effects of this tendency to borrow are ignored in lieu of “spiritual development”. What happens when plastic shamans and wannabe Celts are accused of distributing inaccurate information, deliberately misleading others, and even engaging in spiritual and cultural genocide? Often, the response is only an uncomfortable silence. Talking About the Elephant: An Anthology of Neopagan Perspectives on Cultural Appropriation is an attempt to shatter that stillness and to promote constructive communication about the issues surrounding cultural appropriation in neopaganism. The nineteen essays approach such practices and faiths as Celtic reconstructionism, neoshamanism, and ritual magic; and explore and critique topics ranging from academic appropriation of pagan and occult practices, to intra-community intimidation, and potential solutions to the problem of appropriation. The controversy surrounding cultural appropriation in neopaganism is nothing new; however, it’s time to stop pretending the elephant isn’t staring at us as we stand in silence. This powerful, diverse set of voices is poised to break open a new dialogue, one that must occur if our spiritual communities are to balance individual needs with concerned criticisms. An autographed (by Lupa) copy of Talking About the Elephant is available for $20.99 plus priority shipping in the U.S. and air mail in Canada. 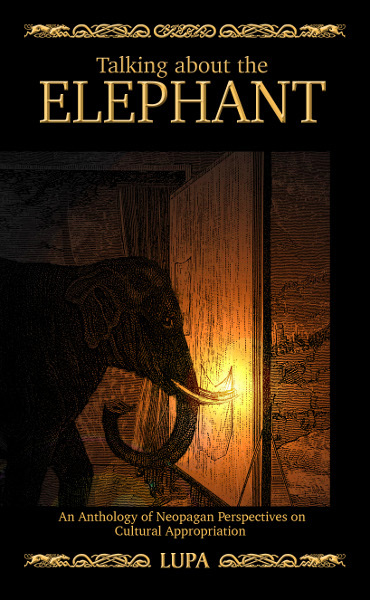 An autographed (by Lupa) copy of Talking About the Elephant is available for $20.99 plus media shipping in the U.S.